LearnDash Review 2019 – Is It the Best WordPress LMS Plugin? Want to create and sell online courses on your WordPress site? The LearnDash WordPress plugin was designed for exactly that purpose, i.e. to help you create and sell online courses on your WordPress website. But is it the best choice? In this LearnDash review, we’ll take a look at its features, functionalities, pricing, and more to help you decide if it’s the right plugin for you. LearnDash is the most popular learning management system (LMS) plugin for WordPress. It’s used by Fortune 500 companies, major universities worldwide, and by professional training organizations to create amazing courses for their users and students. It’s a simple-yet-powerful plugin packed with brilliant features. You can easily configure its settings and create mind-blowing courses on your WordPress site. If you’ve really interesting and useful information about any topic, you can easily develop online courses, sell them, and earn money online. You can set 1-time price, recurring payments and subscriptions, or membership plans to sell your courses. LearnDash lets you offer an entertaining learning experience to your readers via various gamification techniques, reward systems, and engagement triggers. It entices users to take more courses and improves user engagement on your site. For example, you can show course progress, deliver certificates, award points, and give out badges to encourage learners. The LearnDash plugin has a really simple, user-friendly interface which allows you to effortlessly configure its settings to create online courses. 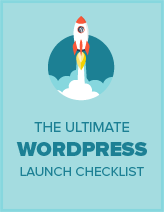 To get started, you’ll need to install the plugin on your WordPress website. For more details, follow our guide on how to install a WordPress plugin. After you install and activate the plugin, you’ll see LearnDash LMS added to your WordPress dashboard menu. Click on that and go to Settings. Then, click on the LMS License tab and enter your username and license key. You can find the license key in your account on the LearnDash website. 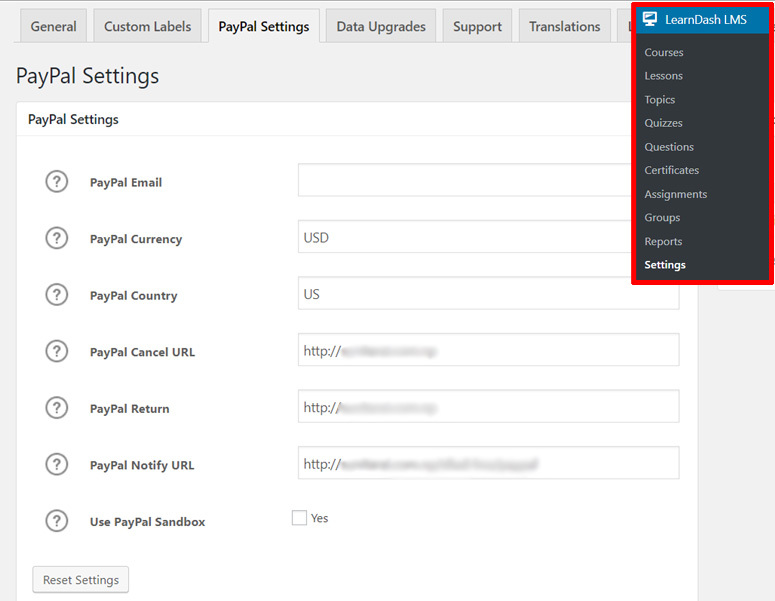 Next, you go to the PayPal Settings tab and enter your PayPal details to accept payments. After that, you can review other tabs in Settings. Once you review them all, don’t forget to click Save. To add a new course, go to LearnDash LMS » Courses from your WordPress dashboard. Then, click Add New. 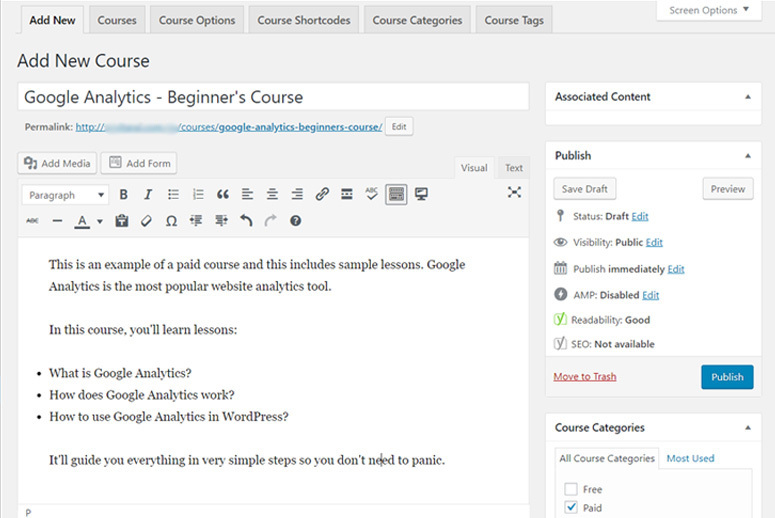 Now you’ll see a course editor which looks just like the regular WordPress post editor. Add your course title first. Then, add the course description in the post area. As you scroll down, you’ll see LearnDash Course Builder. From there, you can add lessons, topics, and quizzes to your online course. You can add lessons by clicking the Add icon in the Lessons tab. Once you add the required number of lessons, drag them to the right column. A lesson can have many topics. A lesson is the heading whereas topics are subheadings within the main heading. To add topics, you can click the Add icon in the Topics tab. Once you add the necessary number of topics, you can drag them inside the proper lessons on the right-hand panel. Make sure to expand your lesson to add topics to it. Similarly, you can add lesson quizzes by following the same process. You can add quizzes lesson-wise as well as globally for the entire course. 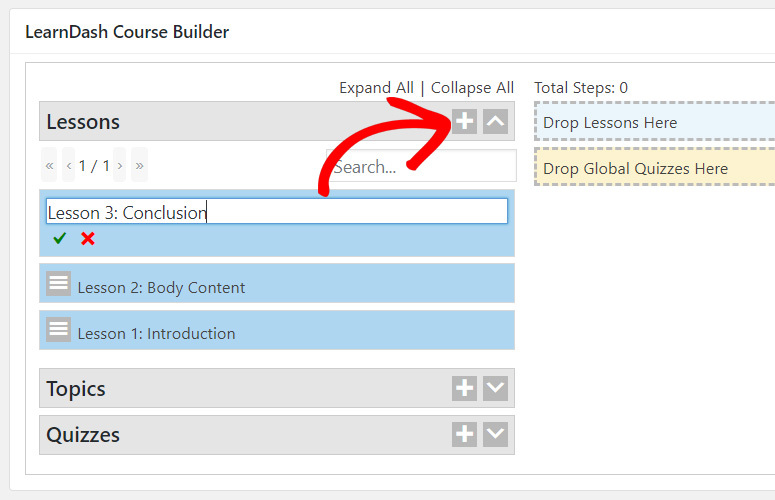 Once you add enough lessons, topics, and quizzes to your course from the LearnDash Course Builder, you can scroll down to LearnDash Course Settings. From this section, you can set different options for the course like course materials, course price type, course points, associated certificate, etc. After you review all the settings, go ahead and click Save Draft. Now you’ll see an Associated Content section added at the top of the right sidebar in your course editor page. The Associated Content section shows you all the lessons, topics, and quizzes created for your course. You can see the general outline of the course from there. Let’s go ahead and check how to add content to the lessons, topics, and quizzes. Now that we’ve created the outline for your first online course, we’re ready to add content to the lessons, topics, and quizzes. 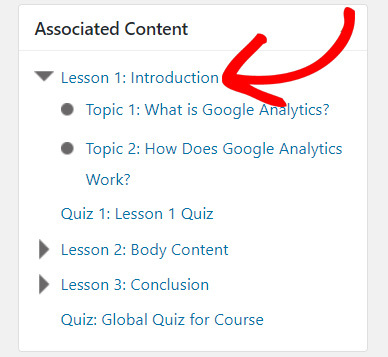 All you need to do is to go to the Associated Content section and then click the title of the lesson, topic, or quiz you want to add content to. For this tutorial, we clicked Lesson 1: Introduction. 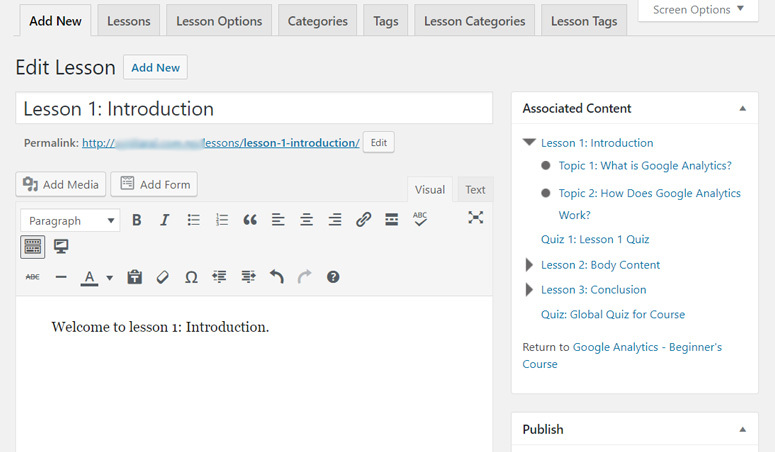 It’ll automatically open the editor where you can edit and add content to the respective lesson, topic, or quiz. Now you can add text, images, and even embed videos into your lessons. Then you can scroll down and configure your settings. You’ll find a similar interface for Courses, Lessons, Topics, and Quizzes so it’s easy to configure them all. Once, you add content to all the associated lessons, topics, and quizzes, you can go to the Course Editor and publish your course. LearnDash comes with a full set of features and options to enable you to provide an exciting e-learning experience to your users. Now that you know how to create an online course with LearnDash, let’s check out some of its most interesting features and options. You can award official certificates to your users based on their quiz performance, completing a course, or both. The certificates are fully customizable and support dynamic data including username, course or quiz name, score, and much more. Certification options make your courses more authentic and helps to gain the trust of your users. LearnDash makes selling your online courses super easy. 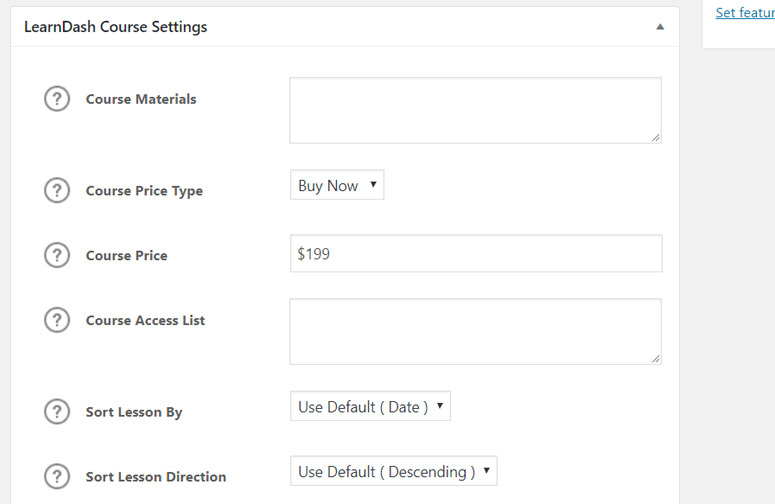 It has easy options to let you set price for your online courses, choose a payment schedule, and take orders. You can set it for a 1-time purchase, recurring payments, or membership plans. LearnDash creates front-end user profiles for your customers. By going to their user profiles, they can track their course activity easily. LearnDash provides you with powerful administration options to organize your learners and courses well. You can group your students, run reports on user enrollment, progress, and quiz performance, expire course access, and much more. LearnDash features a number of free and premium addons to let you extend the functionality of your learning management system. It has extensions for WooCommerce, bbPress, Stripe, MailChimp, Slack, and many other popular applications. You can see the full list of LearnDash features by going to the official LeanDash website. LearnDash is a premium plugin with 3 pricing plans. The best thing about their pricing is that they offer a heavy discount on occasion, so keep an eye out! 1. Basic: The Basic plan normally costs $199, however, you can get it for less when they’re offering a discount. They offer a discount of up to 40%. 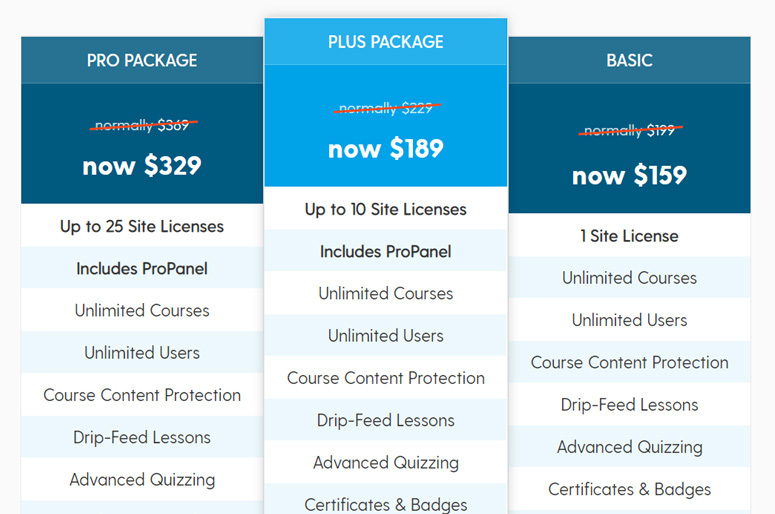 If you purchase this plan, you can get 1 site license and all the LearnDash features except for the ProPanel. ProPanel is an advanced reporting addon for LearnDash. 2. Plus Package: The Plus Package normally costs $299. It can be used on up to 10 websites. It includes all the LearnDash features including the ProPanel. 3. Pro Package: The regular price of the Pro Package is $369. With this package, you can get up to 25 site licenses. All of these pricing plans include 1 year of support and updates. Plus, you’ll get LearnDash’s demo site files. LearnDash’s Help Center provides a rich FAQs section where you can find answers to pre-sales questions, technical questions, and other general questions. If you need personalized support, you’ll need to open a support ticket. The LearnDash plugin is undoubtedly the most powerful and user-friendly WordPress LMS plugin. It allows you to create full-fledged online courses easily on your WordPress site and earn money by selling them. The plugin has a complete set of features to organize courses and your customers. It also has interesting options to engage your learners and encourage them to take more courses. In addition, it has integrations with a number of popular plugins and applications, so you can use your favorite tools to add functionality to your learning management system. We believe that LearnDash is the ultimate learning management system plugin available today. So we highly recommend LearnDash to any of our users who want to create online courses, sell them, and make money.